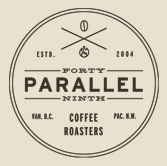 Local boutique coffee roaster, 49th Parallel has announced that it will open a second café location next month, located on Main Street at the corner of East 13th Avenue. The new café will also be home to a Lucky’s Doughnuts counter, representing the company’s first foray into food. The 2,800 square foot café joins the company’s original West 4th Avenue location in showcasing 49th Parallel’s own range of small-batch roasted coffees. In addition, the much bigger new location will include expanded space for single-cup preparation, a 16-seat communal table that can be used for group cuppings, a 30-seat patio on the East 13th Avenue side, and garage-style doors that create an open-air space during warmer weather. Bringing together the classic pairing of coffee and doughnuts to the Main Street café is the launch of Lucky’s Doughnuts. Authentic, hand-crafted and genuinely delicious, Lucky’s Doughtnuts are made fresh throughout the day using the highest quality natural ingredients. With all components made from scratch including jams, glazes and fillings, the company also strives to source locally and seasonally. A selection of 13 different doughnuts-six yeast varieties, six cake varieties and a French crueller, will be available each day, with varieties changing with the seasons. More information about the doughnuts will be available at www.luckysdoughnuts.com. The new 49th Parallel Café is located at 2902 Main Street (@ East 13th Avenue), and is slated to open during the first week of June. Hours of operation will be Monday to Saturday, 7 am to 10 pm; and Sunday, 8 am to 8 pm. 49th Parallel Coffee Roasters endeavours to source the world’s finest coffee beans and roast them to satisfy discerning palates. With a true passion and dedication for specialty coffee, we are committed to offering only the freshest, highest quality coffee to our customers. Every batch of green coffee is carefully roasted to bring out its preeminent qualities. Our buyers travel around the world to meet directly with the farmers at their coffee farms in order to develop relationships that create a better future for everyone involved. Every coffee is precisely cupped and carefully evaluated. No exceptions. No short-cuts.